Plus, why Liverpool are improving under Jurgen Klopp. 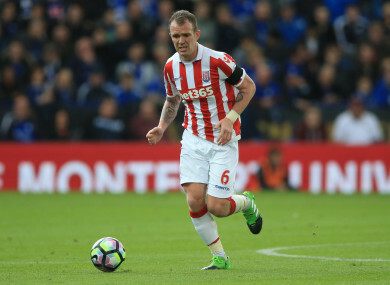 Glenn Whelan left Stoke to join Aston Villa in the summer. IN NOVEMBER 2014, ex-Liverpool and Tottenham Director of Football Damien Comolli gave a talk in Dublin at the Web Summit. “If there’s someone in the room who can, in the next five years, measure team chemistry, please contact me,” he said at one point, as quoted by the Irish Examiner. The remark comes to mind when assessing the current situation at Stoke City. Since gaining promotion to the Premier League in 2008, the club have generally punched above their weight given the limited resources they must rely on compared with other sides in the division. During nine seasons in the top flight, they have finished no higher than ninth and no lower than 13th. But having previously established themselves as a solid mid-table club, this season, arguably for the first time since being promoted, they appear to be in serious danger of getting relegated. Monday’s 1-0 loss to Newcastle leaves them two points off the drop zone, with all the teams beneath them having at least one game in hand. A key issue this season is the absence from their squad of Glenn Whelan and Jon Walters. Whelan joined the Potters in 2008 while Walters signed in 2010 — both, therefore, were with the club for all or the majority of their successful Premier League years before being sold last summer. The duo were not the most talented of players, but for many years, their work ethic and tendency to lead by example made them the heartbeat of the Stoke side. Darren Fletcher, the player essentially brought in to replace Whelan, is better individually than the Irish international, but Stoke look a weaker side without the Dubliner, which highlights how complex football can sometimes be. As Comolli says, you cannot measure chemistry, but surely Stoke’s struggles are not unrelated to the absence of the experienced Irish pair, with their departure likely just as costly off the pitch as on it. Jose Mourinho is known to have a nasty streak and that characteristic was apparent after Man United’s defeat of Everton on Monday. The Portuguese coach was not happy with pundit Paul Scholes’ criticism of his team and in particular, star midfielder Paul Pogba. Against Everton on Monday, both United and Pogba delivered a much-improved display, with the France international making key contributions at vital moments in the match and having a hand in both goals. Mourinho was entitled to disagree and provide a counter-argument to Scholes’ criticism, but the manner in which he went about it, making personalised comments, left a sour taste. “It’s not Paul (Pogba)’s fault that he made much more money than Paul Scholes,” Mourinho quipped, with his words not for the first time highlighting the coach’s lack of class and tact. It’s still less than three months since Liverpool’s demoralising 4-1 loss to Tottenham, while the Reds were also hammered 5-0 by Man City earlier this season. Such results left some fans and critics questioning whether the club had progressed at all or indeed gone backwards since the end of the Brendan Rodgers era. Yet since then, the outlook has become more positive. Monday’s victory at Burnley, in particular, felt like a big result. Mo Salah and Philippe Coutinho were both unavailable, while another key player, Roberto Firmino, started the game on the bench. In the end, the visitors showed admirable resilience to earn a dramatic last-gasp win against a Clarets side that have been earning plenty of plaudits for their dogged displays this season, and against whom the Anfield club have struggled in the recent past (they lost 2-0 in the same fixture last season). The £75 million signing of Virgil van Dijk is likely to improve Liverpool’s shaky defence, while even without the Dutchman, the Reds have been pretty impressive of late. Their latest victory means they are 16 games unbeaten in all competitions and remain firmly in contention for a top-four spot, as they sit just three points off second-place Man United. The signs are consequently there that Jurgen Klopp is slowly but surely succeeding in meeting the high level of expectation that coincided with the German coach’s arrival at the club. 4. Can Leicester keep hold of star man Mahrez? Riyad Mahrez played a key role in Leicester’s 3-0 victory over Huddersfield at the King Power Stadium on Monday. The Algeria international, who put in a transfer request last May and subsequently saw a £27 million Roma bid rejected by the English club, scored one and set up another as Claude Puel’s side secured a convincing win. There have been rumours that Mahrez will leave the Foxes in the January window, having been one of the key reasons for their shock Premier League title success the season before last. The 26-year-old will no doubt feel he deserves to be playing at a higher level, either for one of the Premier League’s ‘big six’ or for a top team abroad. With that in mind, eighth-place Leicester could struggle to hold onto their star man over the coming month. “It was a fantastic game for Riyad. I like this player and I’d like to keep our best players,” Puel told the BBC after the match. Email “Stoke missing Glenn Whelan, Mourinho's lack of class and more Premier League talking points”. Feedback on “Stoke missing Glenn Whelan, Mourinho's lack of class and more Premier League talking points”.